Welcome to Area 4 Night mission Walk Through! 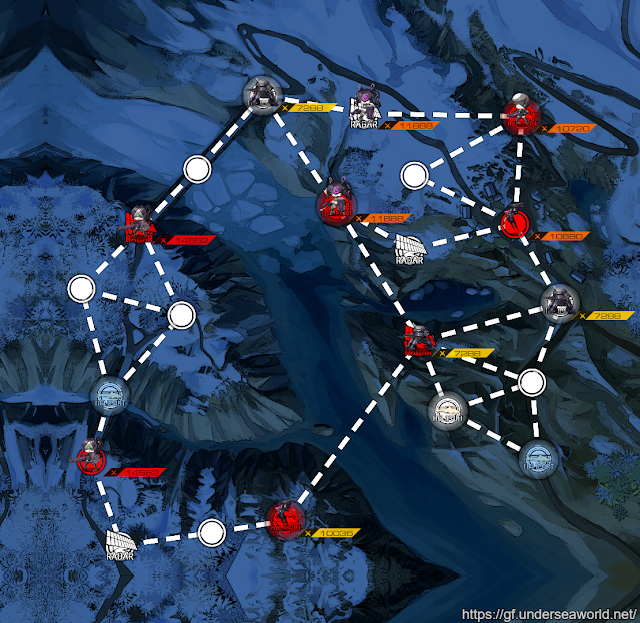 This is first area in the night missions that enemy strength shown increases by 5,000 compared to 2,000 in previous area. So you can expect even your elite echelons to struggle under incoming dps. If you do not have well equipped and well maxed out echelons, be prepared to use additional echelons to spread out the overall damage incurred. 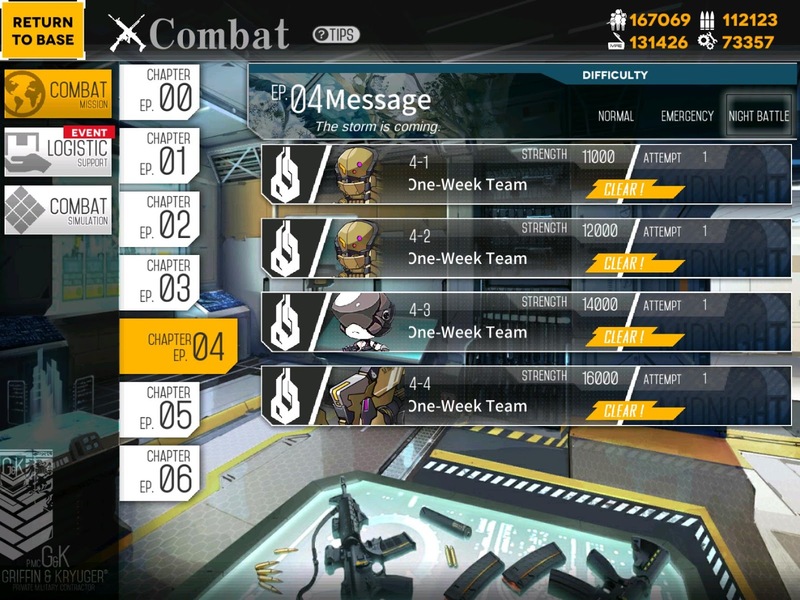 I am still using same echelon set ups I explained in Area 1N Walkthrough, with minor change being my RF Echelon has since increased in Combat power via additional links. And frankly, I needed every bit of strength to beat 4-4. One good thing about the Area 4 is that they are far more generous in turn limits at least from my perspective. So if you really want to clear missions and your squad is beat up, you can do tactical retreat via helipad, healing up from main screen and redeploying them fully healed at a trade of giving up S rank clear is possible. Well, let’s get started. Map View. This map feels oddly similar from last area. Notice the separation of unit types from top to bottom. Enemy Str has not jumped that much since 3-4N. RF echelon starting at top, AR on the bottom. With spare action point, I spawned dummy echelon but it’s not a must. 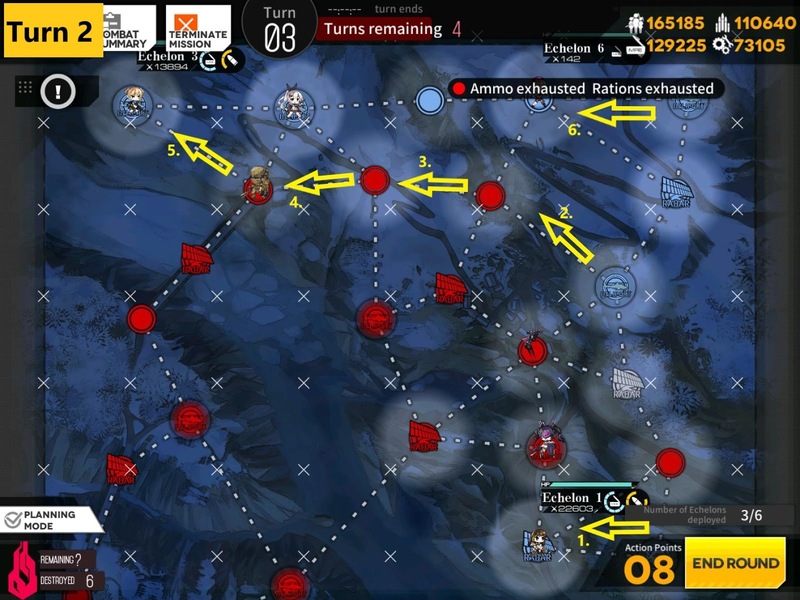 You should have spare turn to still clear the mission without it. 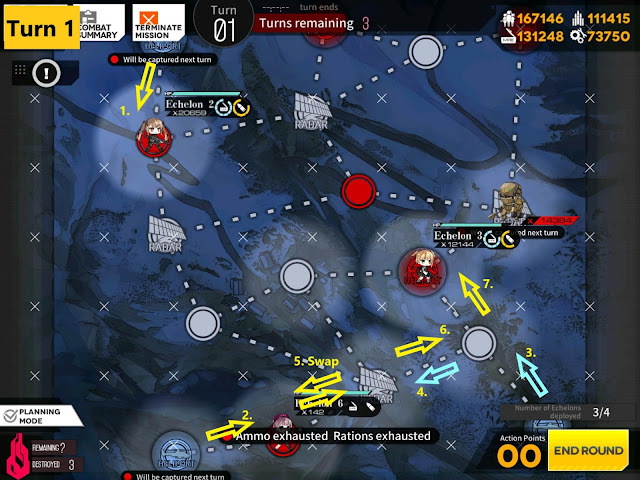 I was being dumb and didn’t see the route that can clear all enemies by turn 3 with 6 Action points you have. But since they give you extra turn to do it, you can be dumb like me. Suggested route is shown above. Map View. 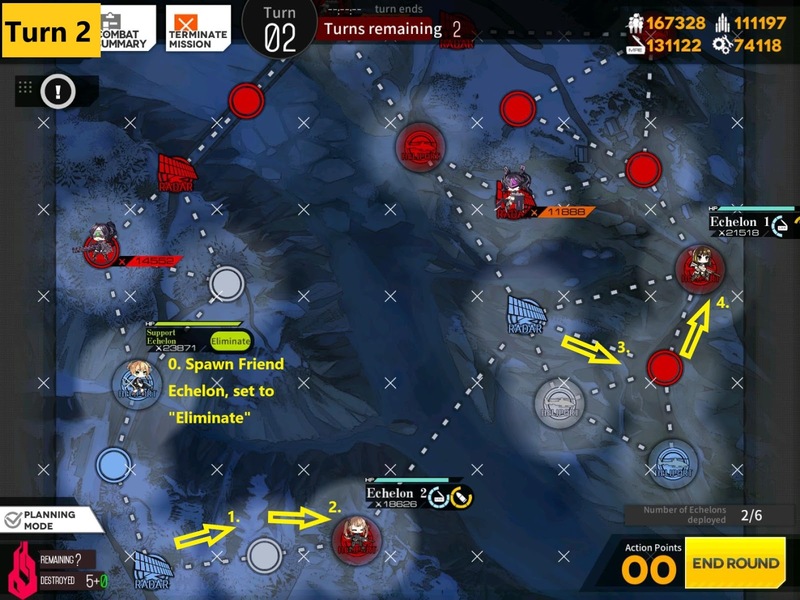 Starting with 2 combat Echelons on helipads on the left with your elite echelon starting on bottom left. Dummy echelon starts on the bottom right. 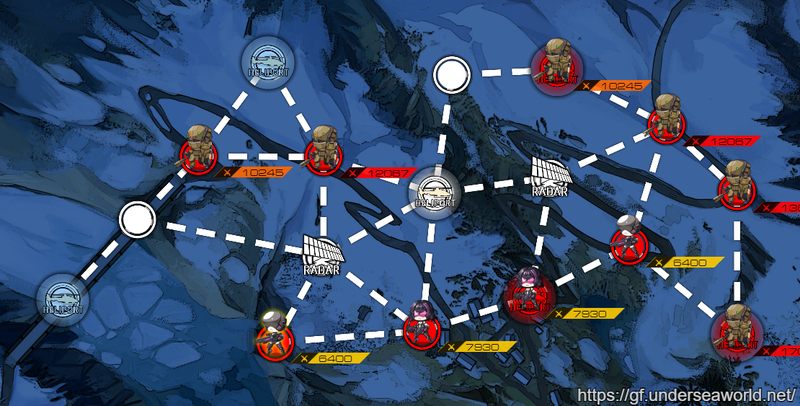 Move combat echelon one each to fight the enemy unit surrounding the helipad. 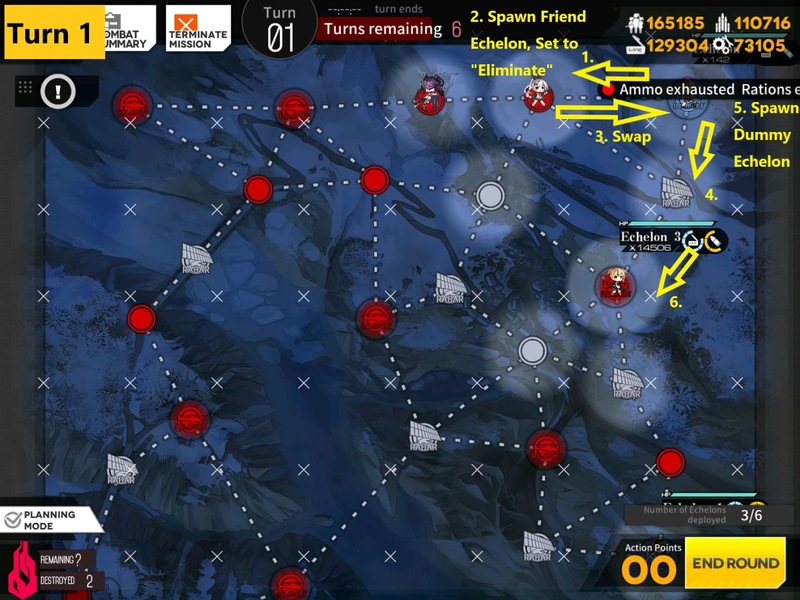 Dummy echelon moves to swap with main echelon at the bottom, then main echelon moves to take helipad in the center. On turn 2 you have 2 potential route. If there is an enemy unit on the radar next to center helipad, take red route. 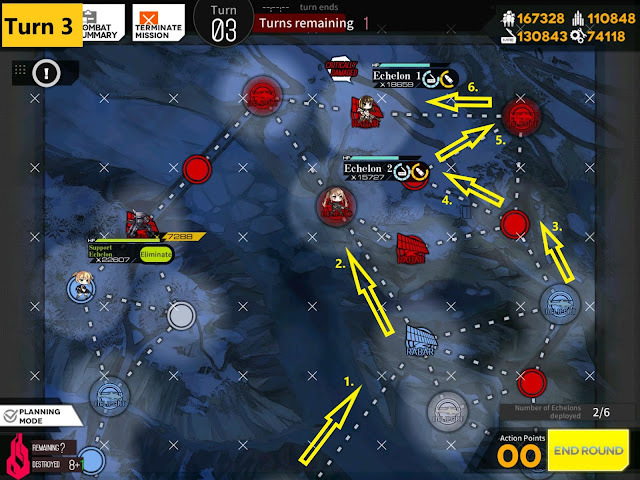 If there is no enemy on radar node, take yellow path. Depending on the movement you can either kill all units this turn or be able to finish it off on next turn. Map View. There are no armor units in this mission. Notice large difficulty jump, kiting and retreating tankers will be important to survive here. Again you have plenty turn to get to enemy so if it gets tough, thrown in another echelon if you have a spare. Notice that I have no HG in the echelon so I have limited vision. This is decision i made because i don’t have well raised HG unit unless I pull them out of RF… and frankly i was being lazy. 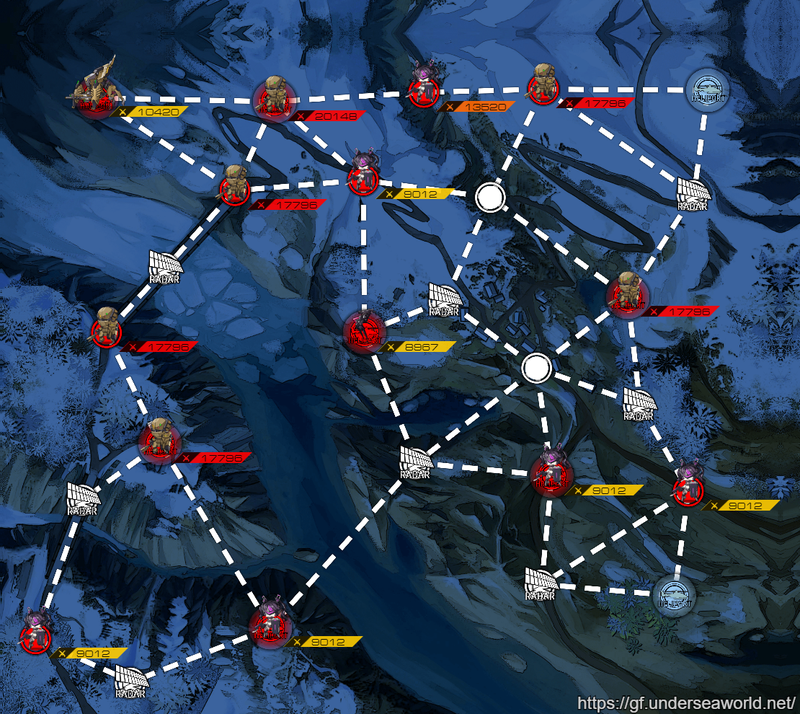 But with radar nodes under control I don’t have any issue next turn. 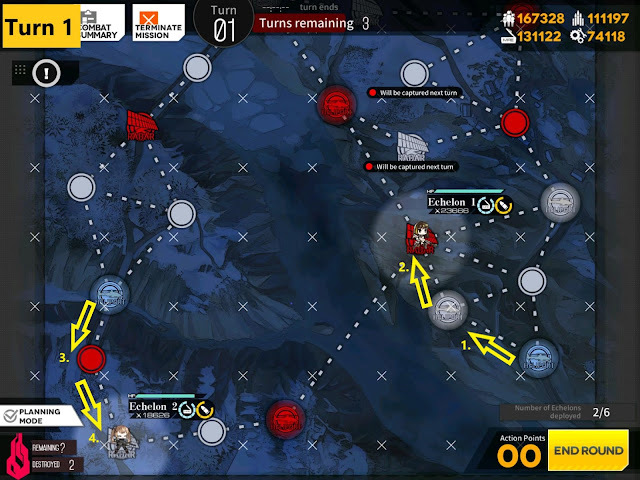 Turn 2 is all about setting up so that we clear the bottom half of the map and clear top half on next turn. Friend Echelon will make its way up on top left. 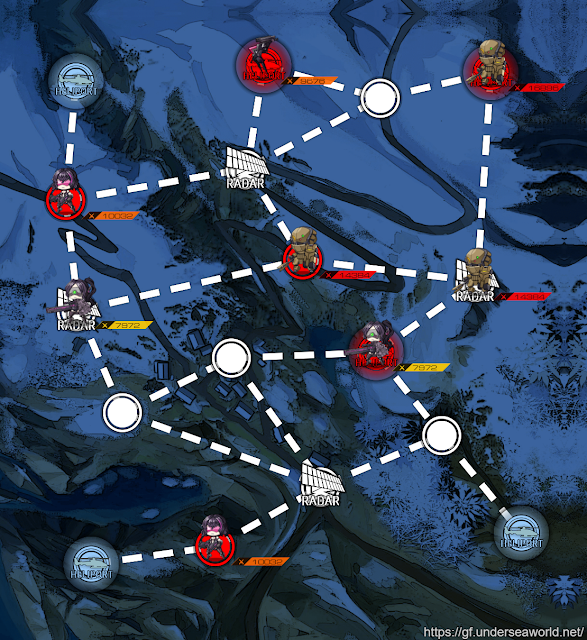 There is small chance that this path will not kill all the enemies but we do have spare turn left. 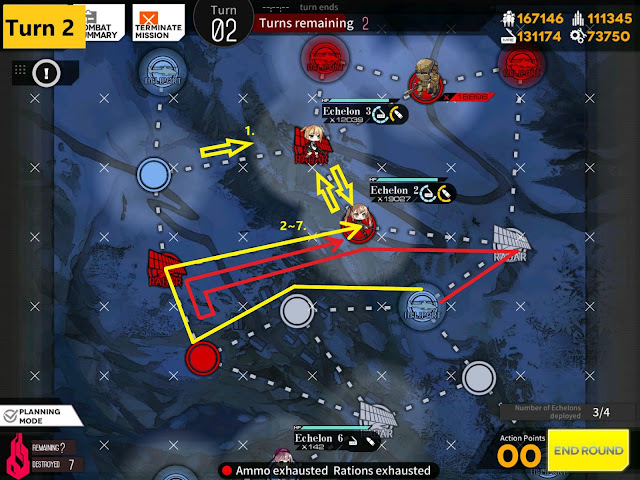 Also If you have HG in a AR echelon you can save an action point when going through top right area [4~6]. So if you are looking to save resources, HG is not a bad option. Map view. Manticore is stationary so you will have to go to him. This map hurts. A lot. 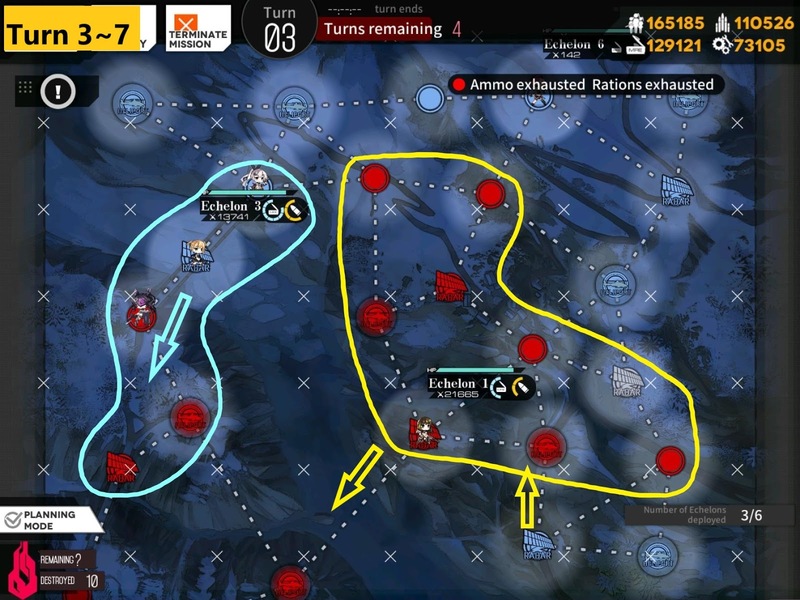 Be prepared even with well equipped echelon. I Started with AR echelon on the bottom helipad and RF echelon on top helipad. All the action on turn 1 happens on top. Move 1 to left, spawn Friend Echelon that can take on Armor units as well as sniper units then set to eliminate. Swap with RF echelon back to HQ, then RF echelon moves one down. Spawn a dummy unit on helipad, then move one more down to take enemy helipad. AR echelon on the bottom moves 1 to left to take radar. RF echelon moves to take down Manticore. Dummy Echelon moves on the left to make sue that dummy echelon moves to left again to take helipad. 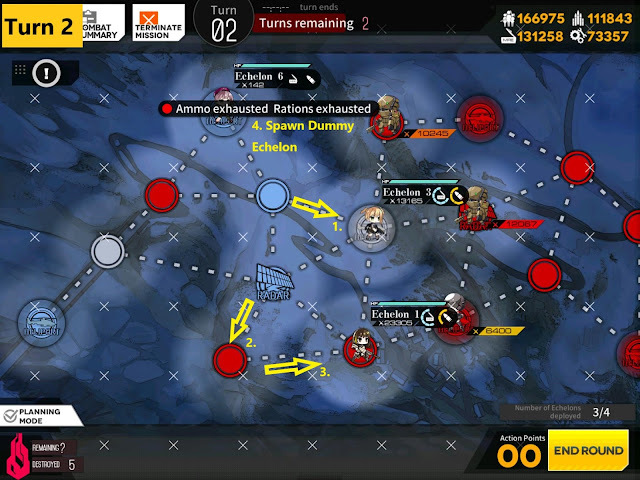 Starting of turn 3, you should have 8 Action points. 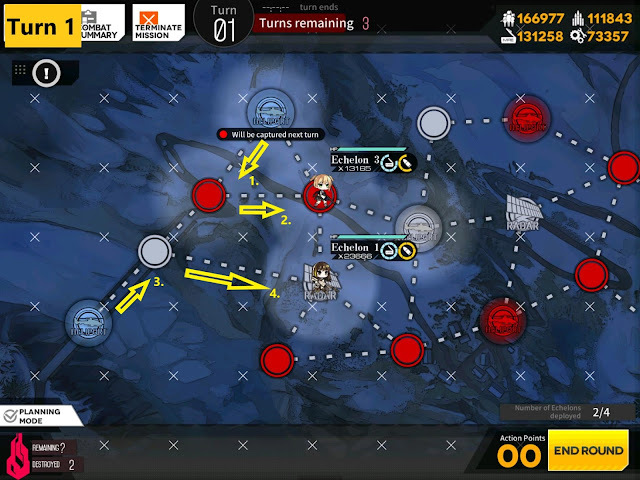 Use AR echelon to sweep the yellow area first, then move down towards the bottom left area of the map. RF echelon should take care of remaining armor units on the top left as it makes its way down from the top. 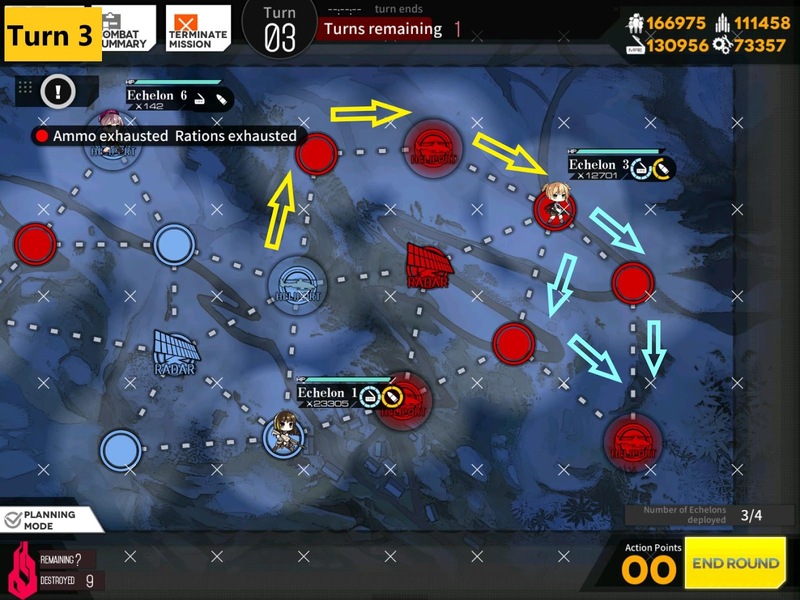 With 4 turns remaining, you should be all set.